There was a time in my life when I thought a great deal about the nature of reality. 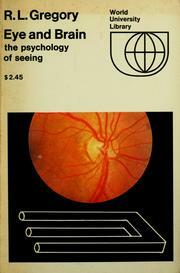 During this period I read Gregory’s now classic, Eye and Brain while researching the relationship between the eye and the brain with respect to perception. Discovering R.L. (Richard Langton ) Gregory’s name in the list of essays was like seeing an old friend and piqued my curiosity. I read “Recovery from Early Blindness” for ITP’s Applications Class and was alternately disappointed and offended by the near clinical disregard for the life of the paper’s human subject who had his vision restored through a series of surgeries. I was unable to relate to the frat-boy exuberance at having a “real live test subject” by which a number of philosophical and psychological theories could be vetted. The information within this paper was obtained by the coin of a man’s bewilderment, suffering, and eventual suicide. The excitement generated and experienced by a society which left a human being to fend for himself after a life-changing event was misplaced at best. While the sensationalism accompanying the successful operation(s) rightfully promoted the careers of key medical personnel, it also possessed a darker side. Throughout the readings and BBC interview, there was an element of thoughtless freak-show curiosity reminiscent of that which accompanied another English medical patient named Joseph Merrick. Aside from the above, as I read this paper I couldn’t help but wonder if it was the best introduction to the work of one of last century’s better-respected experimental psychologists. Before getting to what was presented in “Recovery from Early Blindness” I’d like to introduce you to some of what I learned from reading “Eye and Brain” and then return to the “Recovery” article. “Eye and Brain” helped me to begin to understand how easily the mind could be led to misinterpret physical reality through both example and explanation. I remember the book being slow reading as there is an inverse relationship between the impact of a visual phenomenon and the amount of text necessary to explain what you think you saw: the more successful the illusion, the more detailed the hypothesis presented to explain why our brain errs. Hold a piece of paper diagonally along the black line to see how it connects to the red, not the blue line. It’s hard to believe that what you are seeing is wrong even if it is a foot away from you. Gregory’s “Eye and Brain” is populated with examples like the one above nested between theory and observation. His research contained a number of concepts which I have carried throughout my life. One is that contrary to the ego, the brain doesn’t always know the true nature of visually perceived reality. Another concept is a corollary to the book’s thesis: if information between the eye and brain may be subject to conditions which could create an optical illusion, it follows that communications between the brain and its other sensory systems may also be subject to creating illusory phenomena. The definition and investigation of the mechanics of how and what we think we see of the world around us is at the very least, intriguing. The concepts are not restricted to neuroscientists and psychologists. An understanding of how the process of moving patterns of photons striking our retinas eventually imparts knowledge of the world around us possesses physical, psychological, and possibly even spiritual significance. If nothing else, this knowledge can increase our sense of awe, wonder, and respect for the amazing biomachines which we inhabit. Think Different: Trust corporate iconography. Routing out the first great deception of life lies in understanding the physics of what occurs when photons impact sensing cells at the tip of your brain through what are essentially twin holes in your head: your eyes are holes which pass light from the world around us directly to your brain. We live our lives thinking that we are looking out into the world. The issue is that this assumption is fundamentally inaccurate. The fact is that we assemble images of the external world within our eye and then translate that information such that we project what we see into a spatial volume outside and apart from us. Images consist of shape, shadow, color, tone, and location in space. What we see in an image may not on its own communicate information vital to the survival of the organism. Inferences regarding danger, proximity, safety, food, hot, cold, sharp, blunt, or useful, occur in the brain which processes visual data. From the battlefield, to the bedroom, and beyond, both eye and brain have evolved to help safely navigate our bodies through rapidly changing scenarios during the challenges of our lifetimes. The eye is an incredibly complex extension of the brain. While we think that we are seeing everything in our visual field in sharp focus, the reality is that we are not. There is one relatively tiny area in the eye called the fovea which contains the cells which create the sharpest focus of our vision. Adjacent sensing areas do detect imagery but not with the same level of resolution. With a diameter of 1 mm the fovea (point of central focus located at the interior back of the eye) is hard wired to fifty percent of our visual cortex. Through rapid eye movements (saccadic eye movement) we are able to bring sharp focus to our visual world by rotating our eyes up to 500 degrees per second effectively scanning and painting what is in a our field of attention with detailed information. The answer to the riddle of the image below resides in the fovea. If you focus on one dot for five or six seconds, you should be able to stop the movement within the illusion. The movement stops when you hold focus. Allowing the eyes to scan the area at all sets the image spinning. Visual perception may be defined as the result of the combined efforts of both eye and brain. The subject is fascinating, rich, complex, and overlaps a number of disciplines. While “Recovery from Early Blindness” was the research which promoted R.L. Gregory’s career into the forefront of his profession, the essay is out of context with both his later body of work and the significance of the research when it was first published. Reading “Recovery” sixty years later, I was deeply unsettled by the way Mr. Bradford was treated by the operating physician, Gregory, and the social structure in which the subject lived and died. The relatively recent BBC interview with Gregory regarding Sidney Bradford confirmed an attitude that was more about discovery and less about humanity than I was comfortable hearing. In “Recovery from Early Blindness” Gregory investigated and tested the responses of a fifty-two year old man who had his sight restored through corneal transplants. From a sighted person’s perspective the operation was a success: Sidney Bradford regained his sight in 1958. The essay establishes that prior to the operation Sidney Bradford was happily married, employed as a machinist, able to cross streets by himself, and according to Gregory, possessed a high degree of self-confidence. After the operation Sidney was unable to hold any type of job, was fearful of crossing streets, became increasingly depressed, and committed suicide on August 2nd, 1960 two years after the surgery. Once Mr. Bradford became sighted, he was subject to the same workplace standards as sighted machinists were held. Complicating the very real social pressures both in and out of the workplace, Sidney was unable to recognize facial expressions. He also could not identify the faces of his friends and recognized them only when they spoke. I understand R.L. Gregory’s expression of scientific delight when his research subject expressed surprise at seeing a giraffe, amazement at the rich variety of colors in nature, failed to see depth in pictoral illusions and more. What I do not understand is how Dr. Gregory, the hospital where the surgery was performed, and/or the operating surgeon failed to provide lifetime counseling or assistance for their human lab rat. This is a morbid illustration of, “the operation was a success but the patient died, slowly over time.” Bradford was not only bewildered and frustrated with his vision: he was also disappointed to his core. BBC puts a soft spin on a difficult truth in an attempt to ameliorate a guilty conscience. “His story is in some ways tragic. He suffered one of the greatest handicaps, and yet he lived with energy and enthusiasm. When his handicap was apparently swept away, as by a miracle, he lost his peace and his self-respect.We may feel disappointment at a private dream come true: S.B. found disappointment with what he took to be reality. Not much remorse, sadness, or acknowledgement of the simple fact that as Sidney Bradford faded from the headlines the good doctors (and society) abandoned their science project to descend into a greater darkness. Whether or not Sidney Bradford should have been afforded the consideration which research chimpanzees enjoy today is beyond the scope of this text. The greater question revolves around the ethical deployment of technology. Should technology be brought to bear to “correct” a situation just because it is possible? There are a lot of people who would say “yes” for any of a number of reasons. After reading about the arc of Mr. Bradford’s life, I am no longer certain that my traditionally bullish attitude toward technology is the only path forward. There is a very real application of a kind of Newtonian physics at work then, now, and into the future. It is a law of action and reaction. The law of unintended consequences exists in nature, our families, the laboratory, and the work bench. We are all are responsible for what we create and how it effects society and our planet. Rest in Peace Mr. Bradford.